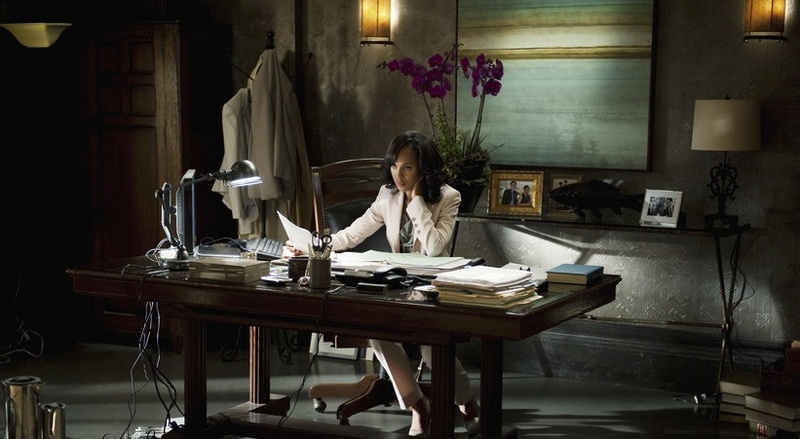 Scandal Costume Designer Lyn Paolo on working with Kerry Washington, Prada and what's next this season. While we may have tried desperately to avoid being sucked in by your dramatic entrances and exits, whiplash-inducing plots twists and maintain a steady side-eye in the general direction of your near-fanatical following on Twitter, we've fallen for you. Hard. So much so that we've pretty much unreasonably taken to boycotting the Olympics for the sole purpose that we point our fingers in its general direction for your mid-season hiatus. And while we like to think we may have gotten proverbially hooked while managing to avoid falling down the rabbithole that is Olitz fanfic blogs (because, yeah, those are a thing, you guys); we still have some difficultly articulating our ardent excitement for tonight's mid-season return. And while this 30-second trailer may reveal precisely nothing about what we should expect, we figured if there's one woman who can perhaps shed a little light on what we can actually anticipate in the latter-half of the season, its the shows Costume Designer, Lyn Paolo. After all, any real Scandal fan (and we believe we're more than qualified to speak on the matter) knows that the show's wardrobe is often more laden with meaning and metaphor and shrouded with symbolism than the words coming out of the characters mouths, right? And so we quizzed (well, more like harassed) Paolo with our questions on everything from Kerry Washington's input on her character, why all the white, and why things may (gulp) get worse before they get better. "In the second half of this season, Olivia will often be in darker clothes as the story line darkens. There is a lot of intrigue and behind the scenes scheming going on between the characters and both Kerry and I have worked rather hard to be true to Olivia's palette but sometimes some of the things that have happened in the story have made us want to use darker tones. "I felt that the first season was all about the Tory Burch trench, the second season became about coats in general: Escada, Armani, and Dior. This season it has been about the Prada purses, Burberry and Dior coats, and lots and lots of gloves by Gaspar, our local, custom-made glove company." "The idea of white being used in the show came from the pilot script, which the amazing Shonda Rhimes wrote, [and] she discussed being a 'gladiator' and 'wearing the white hat'. These lines had a huge impact on my design process, and the whole idea came from those fantastic lines that she wrote. However, the use of color to tell the story had grown over these three seasons, and we try to tell the story throughout the use of color. How does a character feel? What is happening in a particular moment? So when Mellie is jealous, she wears green, [and] et cetera." "The themes of the second half of the season are darker than ever before, the relationships are becoming more and more complicated and difficult, and to express this darkness we have been using a lot more dark: grey, navy blue, and YES—even black." "From the very beginning, Kerry and I decided that the Olivia Pope from the present, who has her own company and her band of gladiators, had to wear pants. So that meant that in flashbacks, Olivia would be a skirt lady, and even dresses. The only time we have broken this rule is when Olivia attended the Christening, as we felt that as she was to be Godparent to the baby, she would dress up to go to the church. Additionally, to help the audience understand quickly that we are in a different time, we do not use Prada purses in flashbacks, as she usually carries a Goyard or Ralph Lauren purse."